Saint Patrick’s Day is celebrated around the world by the irish and the irish at heart. Green color is over everything, a clover printed on every sign and restaurant door, and corned beef and cabbage is all about. However, St. Patrick’s day wasn’t always a massive celebration of irish culture and heritage. It started as a simple feasting day to celebrate the patron saint of ireland. How could one man deserve such a festive and widely celebrated holiday? Well his history is a pretty big hint. St. Patrick was the man who spread christianity to ireland, but he had more… humble beginnings. Saint Patrick was born in england in roughly 385 A.D. His father a Roman deacon and his mother a close relative to St. Martin of Tours, he seemed destined to live a life of religious fervor. However, he was not actually heavily focused on religion by his parents, nor was his education stressed, much to his embarrassment later in life. At the age of 16, the young Patrick was captured by Irish pirates and sold into slavery where he was to tend to sheep. Patrick saw this as God testing his fate and he grew increasingly devout as his time in captivity went on. His dream was to free ireland from druidism, the primary religion at the time. After six years of captivity Patrick got his idea for escape in a dream. He managed to convince several sailors to take him aboard their ship. The sailed to france where they abandoned their ship and went separate ways. Patrick went to Auxerre, France to where he entered the priesthood. He never lost sight of his goal to convert ireland as time passed and vowed to return. And return he did, as in 431 A.D. he returned to ireland, after being named a bishop by the pope himself, and began to spread christianity. He was met with hostilities at first but he soon hat the minds and hearts of the people and converted great swaths of ireland through blessing, preaching and performing countless baptisms. He died in 461, but not after establishing churches, monasteries, and church officials all throughout ireland, and earning his place on the list of saints. The Welsh corgi, which comes in 2 separate breeds (Pembroke and Cardigan) is a protective, loyal, and friendly pet. The origin of the corgi’s name is derived from “cor” meaning dwarf and “gi” meaning dog. These qualities of the stumpy round pup have made it rise to fame and fortune. According to Welsh Legend, the patterns on a corgi’s fur are the imprints of saddles used by fairy warriors riding the trusty steeds. Legend has it that two royal children discovered a pair of corgis that they assumed to be foxes while they were tending cattle. Being friendly, herding dogs, the children were able to bring the corgis home to show their family. The children claimed that the puppies were a gift from the fairies. The corgis were trained to herd the royal cattle and lived peacefully along with the family. Continuing its royal reputation, corgis skedaddled into Britain’s royal family in 1933. Queen Elizabeth was first given a corgi in 1933, called Dookie. Throughout the years the family has acquired corgis including; but not limited to: Jane, Crackers, and Susan, (who accompanied her majesty on her honeymoon in 1947.) Unfortunately, the mighty reign of their “shortness” in the royal family is coming to an end. Recently the Queen has expressed her concern of tripping over her dogs and hurting herself. An unidentified royal court member has stated that she “worries about too many dogs around her feet and that she will hurt herself badly.” Deceased corgis will no longer be replaced. The shift of fame may be puttering its way to the United States, specifically California. In 2010, California governor Jerry Brown introduced “California’s First Dog,” as Sutter, a Welsh corgi named after a pioneer who established one of Sacramento’s first settlements. Sutter was given to Jerry Brown by his sister, a former state treasurer. The chestnut fuzz ball has received support on social media such as his Facebook page (Sutter Brown) as well as on Twitter (@sutterbrown). The fame of this breed is rising despite its own height. This fairy-transporting steed is the best dog, paws down. Clubs are an important part of the culture here at El Camino Fundamental High School and the newest club fits right in with the others. FIFA is a soccer video game that allows all its players to experience playing as their favorite team or player. FIFA League was created on january twenty first and consists of twelve members that organize meetings and times to compete in a FIFA tournament. All records of wins and losses are kept by the club secretary Kyle Rairdon and separated into categories 1 vs. 1, 2 vs.2, and 2 vs. 1. All members chip in to buy food and drinks for when they meet and this helps enhance the feeling of unity in the club. Anyone can join as long as they meet the pre-decided requirements written in the official FIFA League constitution and are an Elcamino student. This club caught like a fire when it was first mentioned and received all twelve of its members before it was even created and is even known at other schools. This club will continue into the next school year and will continue to provide joy to all of its members. I highly recommend it to all students looking for a club to join. In case you haven’t figured out why all you see on Instagram is girls’ selfies, there is a distinct reason behind what might otherwise resemble a vanity crisis on a grand scale. What is known as the “20 beautiful women challenge” or simply “#20beautifulwomen” is a widespread movement where girls post selfies and tag 20 of their friends, essentially nominating them to post their own picture and tag their own friends. The admirable purpose of #20beautifulwomen is to inspire self-confidence and self-esteem among women everywhere. When even the shy girls who normally refrain from posting pictures of themselves participate, it can be said that this has succeeded. However, those girls who post seven consecutive selfies from different angles “#SelfieSunday! #MoreSelfies! #EvenMoreSelfies!” and manage to receive varying praises from commenters must be rejoicing at this unique chance. It’s not to say that these selfie fiends should be discouraged from taking part in #20beautifulwomen but rather that they should realize that posting pictures occasionally will do much more for the psyche than constantly and incessantly fishing for compliments and reducing all followers to thinking “oh. She posted…five selfies in a row. Great.” and scrolling through. Do we really have to specify that there are 20 beautiful women? Tagging 20 people in a single photo is convoluted and eventually results in the popular girls being nominated way too many times by all of their friends and those trying to curry favor with the popular cliques. The inclusiveness is understood, but we don’t have to make every girl currently in existence post a photo. It should be their choice, and not at the discretion of some girl who arbitrarily decides on their 20 most beautiful (or, as is usually the case, closest) friends. This often leads to fierce rivalry among girls who were once friends. Just watching the trailer for the movie “Unfriended”–do not watch that–warns strongly against this. At the risk of sounding like a “Meninist,” are men not allowed to promote their self-esteem? There have indeed been parody trends for #20beautifulmen or similar tags, but they are not taken particularly seriously. Maybe it’s because guys (well, most guys) are too self-conscious to post selfies, thinking society has dictated that only girls are legally obligated to display themselves. Though #20beautifulwomen is a fantastic trend, what’s wrong with #20beautifulpeople (apart from the wording)? After all, everyone is beautiful. And we should all be encouraged to accept each other, regardless of the quality of selfies we take. If that’s a criterion for personal quality, it’s time to take a serious look at this overexposed society. You walk into class and see a woman with an ear to ear, tooth-filled smile and a projector set up with a slide reading something along the lines of “FIDM Career Options in Design”, and – if you are familiar with what is going to take place over the next hour – you slump down in your seat and wait. Almost annually, El Camino students, along with the rest of the San Juan Unified School District (or SJUSD), are over the course of an hour (which would normally be used for educating) encouraged to attend a private institution centered around fashion design and the entertainment industry. So, why is FIDM (Fashion Institute of Design and Merchandise) allowed to take a whole class period away to try and persuade us students into going to this design college? FIDM is a college with four different campuses, all in California and consisting of 22 “creative majors” to study, which include jewelry design, theaters costume design, fashion design, and beauty industry management. The institute’s main goal is to “prepare students for careers in the Fashion, Visual Arts, Interior Design, and Entertainment industries.” While this may be well and good for a minority of students within the SJUSD, only approximately 7,500 students attend FIDM campuses a year compared to the almost 15,000 high school students in the school district – most of which view the presentation yearly while some students have seen FIDM presentations 2 or 3 times in one year. Out of these 15,000 students, about 3,500 are seniors who would be eligible to attend the institute the following year. So how can a small, private institution that is not at all applying anything we learn in grades 9 through 12 – such as fashion design, interior design, fashion knitwear design, and much more – be given the right to advertise themselves to 15,000 unsuspecting students during class time in order to convince them to pay to go to this institute while these students are being forced by law to attend this presentation. There seems to be something not quite right about all of this. Aren’t you encouraged to go to a four year college and major in a subject applicable to the real world that can help you become a functioning member of society throughout your entire high school experience? Isn’t that the goal? So if we are giving free (as there is certainly no way that the reason behind all of this seemingly pointless waste of valuable time that could be educating students is because they are bribing paying the public school system, right?) advertisement time to an Institute of learning to try and convince students to go there, shouldn’t it be a critically acclaimed university? If the school district is selling ad space for class time then shouldn’t it be a four year, esteemed university. What about USC, the UC system, Stanford, BYU? If we are going to waste class time on a propaganda stunt, couldn’t we be encouraged to go to a university that can get us somewhere else besides a job shopping for JC Penney’s? Everyone knows that New Years’ resolutions often don’t work out the way people plan for them to. That’s why there is a full gym on January 1st and a practically empty gym the following day. These people make the resolutions in hope of losing their extra belly fat from the holiday season, but they quit when it doesn’t happen right away. One must learn that one needs to work at something to get it done. Sometimes, New Years’ resolutions are resolved, as shown through select El Camino students. Freshman Jayla Perry states that her New Years’ resolution was to spend more time with her family. “I wanted to get closer to my family and be able to talk to them about more things,” she said. Perry worked long and hard on her goals and slowly but surely got closer to family members by coming out to family parties and socializing, rather than sitting in her room and laying in bed. Her resolution was a success. For sophomore Danielle Harrison, her New Years’ resolution was to make the JV Volleyball team at the beginning of the school year. She practiced day and night and did club volleyball to work on her skills. When school rolled around, the tryouts began. She tried out and she nervously awaited the results. “By the end of the week, I was confident that I had made the team, and I had,” she said. Like Harrison, Freshman Kellan Fisch’s resolution was to make a sports team as well: basketball. He practiced almost everyday, but not how one would think. Fisch played basketball on the Wii to get better so he could make the team. For him, it worked. He stated, “I thought I was the best in the world.” Tryouts came along and he tried out alongside the other boys. He soon realized that he wasn’t as skilled and began to worry by the time cuts came around. Because of his worries outweighing his abilities, he unfortunately did not make the team. “My dreams were crushed and I cried,” he admitted. When asked what he could have done to have reached his goal, he said he could’ve played basketball at a park or somewhere else outside. His main New Year’s Resolution for 2015 is to start in his rugby games. Let’s hope he makes it. Resolutions always seem like fake things that people say and give up on the next week. Nevertheless, some students at El Camino have really defied the odds and accomplished their dreams. So if one ever wants to go accomplish their goals, they will be accomplished by time and effort put into it. EBOLA JOKES– insanely comical, right? Do I actually have to say much more about this? MAKING STUPID PEOPLE FAMOUS– I would actually love to see another attractive teenager make a million dollars talking about a relatable problem, I really would. FOOTWEAR– Out of all 2014’s fashion trends, our footwear this year is quite odd. Although I like that trends are getting comfier with leggings and big sweaters in right now, when did socks and sandals become a fashion trend? These shoes look you’re being strapped to an electric chair. If you’re not Jesus please don’t wear Birkenstocks. Enough about the shoes, fashionable socks have gained a lot of popularity this year. Huf socks, for example are socks with marijuana leaves on them. What’s next? Cocaine socks that are just all white? MAKING WORDS MEANINGLESS– When you think of words such as swag, lowkey, and selfie do you even know what they mean? The word “swag” means a very confident and typically arrogant or aggressive gait or manner. When it is used in slang, it can mean the way someone is dressed, or the way someone represents themselves. It’s even used to express excitement, or tell someone they agree with their statement. Swag is so overused that it has no meaning. In the same way, “lowkey” is used all over social media in various ways, and most of the time, it’s just used wrong. Lowkey means modest or restrained. The way people use it, it seems like it’s just an attempt to throw a fancy word in their sentence. In reality, it just makes you sound stupid. Ever since that fateful day Yankee Doodle stuck a feather in his hat and called it macaroni, hats were a crucial and often overlooked cultural aspect of American life. The popular triangular, black hat atop the white and pompous wigs of the British, like many other things, was brought to America and subsequently worn by our founding fathers in the 16th century, and often with a gold lining along the top. Men’s hats wasn’t the only extremely impressionable headgear brought from England. Women’s hats were often extravagantly floppy and heavy with floral pieces. Although these hot headpieces seemed perfect as far as fashion is concerned, times change, and as time changes, culture changes, and as culture changes so do hats. In the 17th century, America experienced its industrial revolution. Wealthy plantation owners and factory owners alike sought out a regal and elegant new style of head wear. This desperate hunger for upscale hats was fed by swanky silk lining towering top hats. As wealth grew, so did the brimmed, cylindrical topper, and this high up headgear is now popularly associated with sixteenth president Abraham Lincoln. Along with freeing the slaves, Lincoln also freed the common American man from the binds of insufficient dome pieces, bringing attention to the silk top hat. English influence could be seen again in the 18th century American women donning small frilly bonnetts all across the expanding US frontier. Covered wagons and covered heads headed westward in the mid-1800s and with a change of scenery, a change of hats was inevitable. Tall top hats soon were becoming too cumbersome for the on-the-go American in the 1900s, and the creation of an adapted, shrunk, rounded top hat – the bowler hat – was created in England by British soldier Edward Coke. Being a known politician, his style quickly popularized and the early 18th century marked a huge increase in American men equipped with bowler hats, yet bowling did not become any more popular. The style would be the basis for other flat and stylish hats in the future, a sort of a guideline for fashionable head toppers going forward. Women adapted the smaller and more compact bonnett and turned it into wide brimmed and feathery hats for the wealthy, taking away the floral and adding fauna, with fur and other skinned animals popularized by these hats. The mid-20th century marked the origination of the fedora and trilby, a wider brimmed hat that was flatter and very well received. Trilbies and fedoras can still be seen on the heads of modern day lawyers, business men and women, or common Americans who enjoy the black coat, fedora combination. Floppy, flat, and protective from the sun, sun hats became popular for not only gardeners but many women of the hippy movement in the later 1900s. The hat can still be seen worn by men or women in sunny climates or simply for gardening. The evolution of hats brings us now to the 21st century, wear an array of hats, like beanies, snapbacks, flat billed caps, worn backwards, sideways, or at any angle imaginable. Our culture can be viewed through many historical events and current conditions, and a good way to find the evolution of the American people is not to look back but to look forward and up, and to see what rests on the top of our heads. 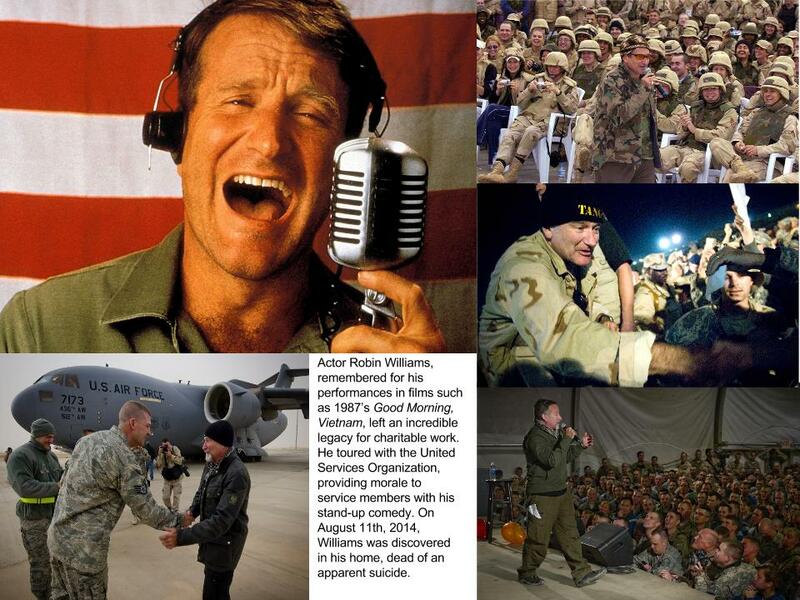 Robin Williams was an American actor and comedian. He brought joy to a lot of people’s lives through his comedy, but what many don’t know is that he donated to and supported 28 charities. Freshman Sarah Pritchard said, “My childhood was full of imagination.” His movies inspired her along with his charity work. She remembers hearing about him perform for veterans and visiting children’s wards in hospitals. This goes to show how much he inspired the public. Some of the charities he supported were Amnesty International and Aid Still Required. Amnesty International is a foundation that works for and recognizes human rights. Aid Still Required helps people who have gone through a natural disaster. Some volunteers work with women and girls with health and trauma therapy to restore peace and confidence. Freshman Jayla Perry said that she thought an important charity Williams supported was Dogs Deserve Better. This foundation provides a rescue home for chained or abused dogs. Perry also stated that he supported the Dream Foundation which strives to better the life of families and individuals who are battling terminal illnesses. Sophomore Danielle Harrison said, “I think that he did it to influence other people to do charity work. But if people are going to do charity work, it should be because they want to help, not because a famous person did it.” She was not inspired herself by Williams, but noticed how other people were. Harrison thinks that Dogs Deserve Better is one of the best charities that Williams supported. To many, Robin Williams was not only an inspiration through his comedy, but an inspiration through his work and financial support of 28 different charities and foundations. The ALS bucket challenge is an act of pouring ice water on your head to spread awareness of amyotrophic lateral sclerosis, which is most common in people 50 to 70 years of age and affects the spinal cord and brain cells. The challenge has swept the nation, and even celebrities, like Will Smith, have not backed down from the challenge. Yet, California has been experiencing an historic drought. With residents of California participating, it raises some important questions about the challenge: is it a threat to our water supply? Should people be wasting water as much as they are? Lake Oroville is one of the biggest signs of the drought, and despite conservation efforts the lakes and rivers seem unchanged. 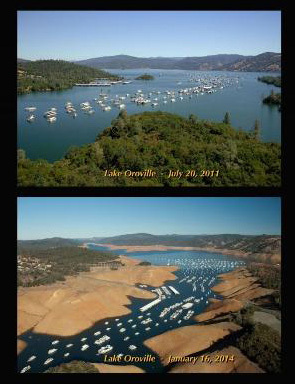 The same view of Lake Oroville, pictured in July 2011 in the top photo and in January 2014 in the bottom photo. Image courtesy of mic.com. Though the ALS videos are entertaining to watch, and it is nice to have awareness and support for ALS, they are not helping the drought situation in California. Californians should find a different way to get the word out about ALS that is not at the expense of our water supply.